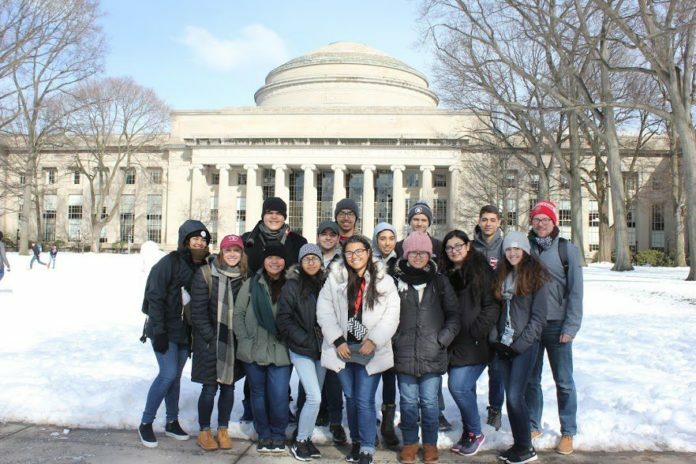 A group of Roma High School students visited Boston earlier this year to tour the area’s college campuses. Teach for America is a national non-profit organization partners with communities to inspire the next generation of leaders to address unequal educational opportunities that fall along the lines of race and class. These students begin this lifelong work with an initial two-year commitment to teach in some of the nation’s most underserved schools. One of these leaders is Taylor Lifka, a member of Teach For America’s 2017 corps. After graduating from Denison College, Lifka joined the corps and accepted a position to teach freshman English at Roma High School. Along with fellow TFA corps member Alejandra Contreras-Macias, she has been a sponsor of Gladiators Go To College. This program, founded in 2007, is offered to sophomores and juniors, and gives students the opportunity to travel to Boston over spring break. Students visit top tier colleges, including Harvard, MIT, Brown, Tufts, Boston College, Wellesley and Boston University. While there, they ask questions, engage with current college students, and think critically about what they’re looking for in an undergraduate program. For many students, they are the first member of their family to apply to college and without this program they would not have the chance to explore educational options outside of the Valley. Lifka views the program as crucial to exposing her students to opportunities to realize their potential. Sponsors like Lifka and Contreras-Macias work hard all year to make the trip a success, leading all aspects from logistics to fundraising to chaperoning travel. The impact the program has on students is clear. As a junior, Maritza Garcia had the opportunity to be part of the trip. For Lifka, supporting students like Garcia aligns well with her commitment to the movement of educational equity and helps bring to life the learning she shares in the classroom.